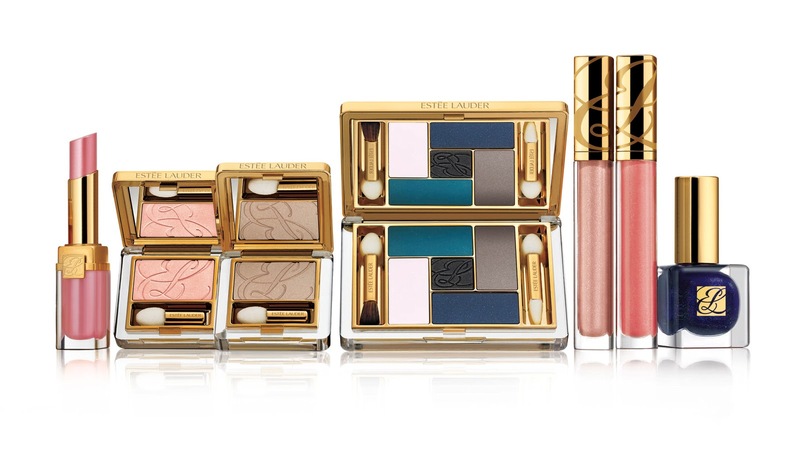 I was saying in one of my rambles on Zuneta recently that I much prefer the autumn/winter collections from the major cosmetic houses than the summer ones, and this a/w collection – the first widely available one from new Lauder creative director Tom Pecheux – is a beauty. I don’t mind admitting that Lauder are – for me – doing some of the most interesting collections of the major beauty houses at the moment, Michael Kors was a total winner, and Bronze Goddess is probably my most favourite of all the summer collections I’ve seen. It’s gorgeous. It swatches quite sheerly, but with a teal-ish glimmer, it’s very good mixed with the other shades in the palette, or patted over the top for a hint of sparkle. Yes, the colour has faded somewhat, but the creasing is minimal, and it’s still quite wearable. The new pure colour shades will be available from July, and the limited edition Blue Dahlia collections (there’s a lavender/lilac version too, which I think I may have to splash out on) will debut in House of Fraser at the same time. Will you be indulging? What’s your opinion on blue eyeshadow? The Fine Print: Palette was provided as part of a PR event, opinions are – as usual – as credible as you think opinions on PR-provided products possibly can be. However, I’ve never had a good word to say about about any blue cosmetic ever, so he fact that I’ve used this every day since it arrived should speak volumes. That, or I’ve suddenly gone colourblind/mad/senile. Next Post Birthday Giveaway Reminder! Blue?! Shocking! Looks like a gorgeous palette though – like the smokey eye look. This looks gorgeous. I think I'll find it hard to resist even though I'll be an impoverished student again by the time the a/w collections are released! The palette looks beautiful! I'm usually neutrals and purples only but I am tempted by this. I'm particularly taken by the smokey eye you've done. The blue palette looks gorgeous! What's the quality of EL shadows like and how much is it? Oh yes. Very lovely indeed. Although the thought of a blue palette fills me with fear… you make it work very well! I like the smokey look with the teal and blue on the lid! Looks great with your eye colour. This is gorgeous. I love blue eyeshadow, sadly I don't think it loves me quite as much. I want this so much though. I've been trying to get into blue eyeshadow recently, but I'm still a big scaredy cat!!! The taupe and teal look is gorgeous. I must try sometimes. Oh, and I loved bronze goddess too.